On view: LaToya Ruby Frazier, FLINT, 1,462 days and counting man-made water crisis. Pledges of Allegiance is a nationwide public art project by Creative Time. The project is a serialized commission of sixteen flags, each created by acclaimed contemporary artists: Tania Bruguera, Alex Da Corte, Jeremy Deller, LaToya Ruby Frazier, Ann Hamilton, Robert Longo, Josephine Meckseper, Marilyn Minter, Vik Muniz, Jayson Musson, Ahmet Ögüt, Yoko Ono, Trevor Paglen, Pedro Reyes, Rirkrit Tiravanija, and Nari Ward. 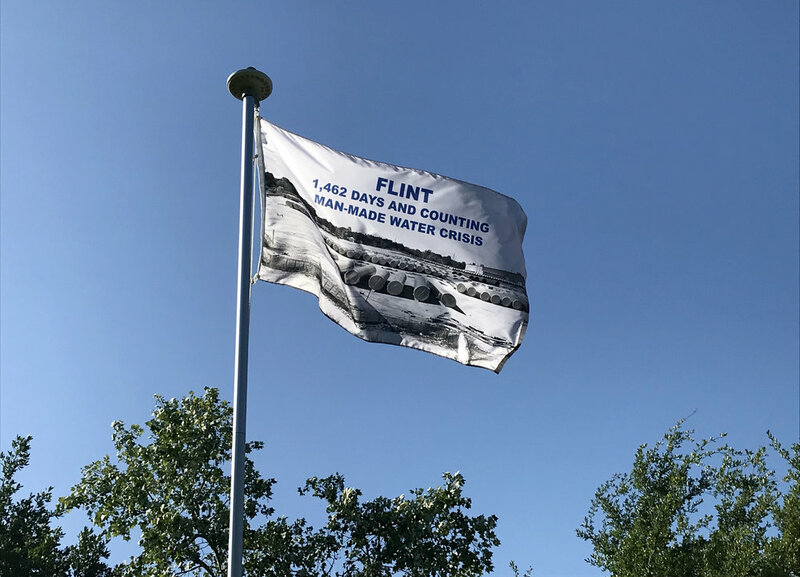 Each flag embodies art’s ability to channel political passion, providing a unifying symbol around which to unite, as well as a call-to-action for institutions nationwide to raise upcoming Pledges of Allegiance flags in solidarity with Creative Time. Pledges of Allegiance aims to inspire a sense of community among cultural institutions, beginning with an urgent articulation of the political demands of the moment. Each flag points to an issue the artist is passionate about or a cause they believe is worth fighting for, and speaks to how we might move forward collectively as a country. Pledges of Allegiance was originally conceived by Alix Browne and developed in collaboration with Cian Browne, Fabienne Stephan, and Opening Ceremony. To share this project on social media, please use #PledgesofAllegiance. The installation of Pledges of Allegiance at Texas State Galleries is located near the Joann Cole Mitte (JCM) parking lot at the corner of West Sessom Drive and North Comanche Street. More information regarding each flag can be found at Texas State Galleries, inside of the JCM Building. Opening January 18, 6 – 8 p.m., Awards 7 p.m. The MFA Communication Design’s juried Showcase exhibition provides an opportunity for graduate students to showcase the best work accomplished in their coursework. Scholarships, funded jointly by the College of Fine Arts and Communication and the School of Art and Design, are awarded for the Best in Show. The MFA Thesis Exhibition is an opportunity for communication design students to demonstrate their advanced problem solving skills by sharing the research they have conducted for their thesis topic. Opening February 5, 5 – 6 p.m.
Glen Rose Formation is the fifth album in Stuart Hyatt’s Field Works series of original music based on audio field recordings. Each album begins with Hyatt’s deep exploration of a region’s soundscape, using captured audio as compositional elements. Combining these field recordings with interviews and historic documents, Hyatt weaves together a sonic palette that is entirely unique to a place. He then enlists fellow musicians to collaborate in the writing and recording of album-length material. The resulting records stand as both engaging listening experiences and site-specific public artworks. Glen Rose Formation was commissioned by the Texas State Galleries. During several visits to the region, Hyatt traveled deep into the Texas Hill Country, inspired by its unique geologic features and subterranean caverns. He enlisted an interdisciplinary team of collaborators—geologists, archaeologists, sound engineers, painters, and composers—in the making of the album. Significant time was spent in one cavern, the “Cave Without a Name” in Boerne, TX, where Hyatt and a team of audio engineers determined the resonant bass frequencies in the cave. These frequencies form the musical foundation of the album’s compositions, which aim to give the listener a nuanced experience of the region’s fascinating geologic history. Hyatt interviewed nonagenarian Mary McGrath Curry, who discovered the cave when she was roughly six years old and her voice leads the listener through the music. The Field Works collective will premiere the album with a live performance from deep inside the Cave Without a Name. A large-scale installation at the Texas State Galleries featuring video projection, a wall collage, collected artifacts, and found objects will coincide with the album’s release. Glen Rose Formation will be included in a seven-album Field Works vinyl LP boxed set, scheduled for release in summer 2018 on Temporary Residence Limited. Performance MARCH 3, 7 P.M.
Video by Mark and Angela Walley. Heather Scott Peterson, Anachrony (detail), 2015, machined brass and wine-boiled leather. Compared with natural phenomena, human interventions have a remarkably brief tenure. Our alterations to landmass, the extraction of resources, the domestication and consumption of organic environs, and the development of technological regimes, seem like modest amendments compared to the shaping of mountains or the drifting of oceans. The substances of the world exist in fixed quantities, capable only of recomposition, redistribution, or transfiguration through time. After several million years, the violence of geologic time may usher forth an unrefined bit of gold onto the shoal of a river, the possibility of a goldsmith one day fashioning a coin, and, eventually, the coin’s surrender to another depositional affair in the tectonic envelope. Copper and zinc—the elements that conspire to form the idiom of brass—are shaped by metamorphic processes beyond our conception of time and scale. Brass is a material more closely aligned with the provisional dynamics of science or the utility of the applied arts than with the presumptive permanence of sculpture. Its resistance to corrosion and wear allowed the esteemed clockmaker John Harrison to harness geographical longitude with the gearing of the first sea clock, and its acoustic and bactericidal properties underwrote the flare and luster of Dizzy Gillespie’s trumpet. The works in this exhibition explore the syntax of matter—to refuse anchorage in time, to slip from the assurances of physical permanence, and to yield only briefly to the geometries and aesthetics of human intention. Natalie Bell, Associate Curator, New Museum, New York. OPENING March 26, 5 – 6 P.M. This annual juried competition celebrates the distinguished work of Texas State University students. This year’s juror is Natalie Bell, Associate Curator at the New Museum of Contemporary Art in New York. Bell has curated and co-curated recent solo exhibitions by Elaine Cameron-Weir, Lynette Yiadom-Boakye, Jonathas de Andrade, Anri Sala, and Andra Ursuta, among others. She has also co-curated several of the museum’s large-scale group exhibitions, including The Keeper (2015) and Here and Elsewhere (2014), which featured the work of over fifty artists from the Arab world. Prior to joining the New Museum, Bell was assistant curator for The Encyclopedic Palace, the International Exhibition of the 55th Venice Biennale (2013). Lecture by Juror Natalie Bell on March 26 at 4 p.m. in the FLEX. OPENING APRIL 2, 5 – 6 P.M.
Fifty years ago the members of the Student Nonviolent Coordinating Committee (SNCC) made a historic call. SNCC leader Stokely Carmichael wrote ”One of the most disturbing things about almost all white supporters of the movement has been that they are afraid to go into their own communities—which is where the racism exists—and work to get rid of it.” Curated by Daniel Tucker, Organize Your Own: The Politics and Poetics of Self-Determination Movements features new works by contemporary artists and poets responding to archival materials related to the history of white people organizing in white neighborhoods, in keeping with the mandate from the Black Power movement to “organize your own” community against racism. Organize Your Own was launched in 2016 as an exhibition and event series, inspired by historically activist working-class white neighborhoods in Philadelphia (the October 4th Organization) and Chicago (the Young Patriots Organization). Materials from these events have since been collected and published in book form. On the occasion of this catalog’s release and still timely nature of its content, a second iteration of Organize Your Own is traveling in 2017 and 2018. Its installation at the Texas State Galleries is part of this multi-city tour. Original funding for the Organize Your Own project came from The Pew Center for Arts & Heritage. The exhibition at Texas State Galleries is funded in part by the Center for Diversity and Gender Studies at Texas State University.